I started a little project. Once a day I will take a close up photo of something that looks interesting, to make me focus on the things around me once a day, to be inspiring. I thought a weekly round up here would be nice. 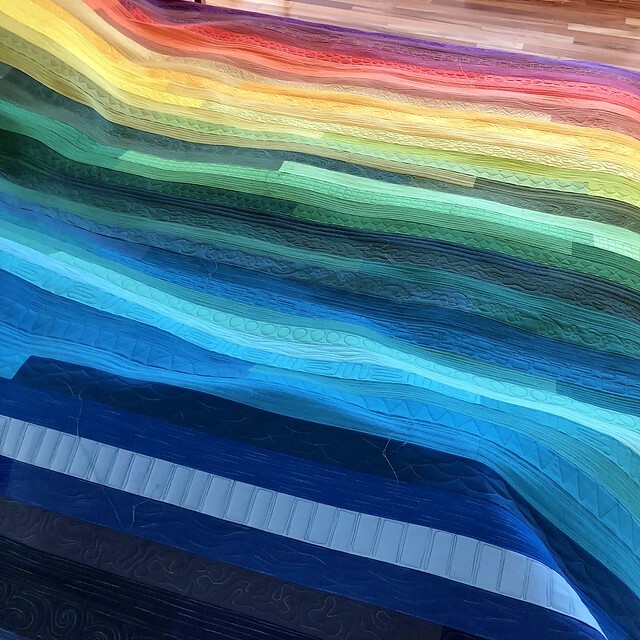 I am sharing the daily photos on instagram @shecanquilt and on my tumblr blog. 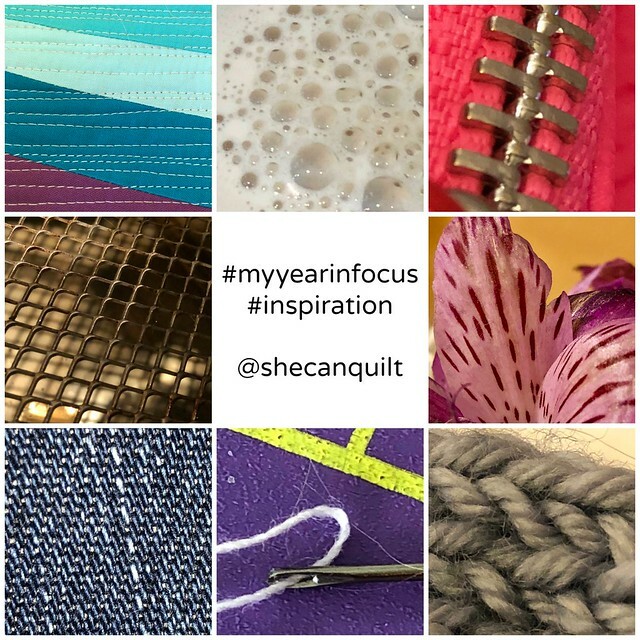 By the way, if you want to join me feel free to use the hashtag #myyearinfocus. If you have Finish-A-Long finishes from Q4 of 2017 today is your last day to link up, don't leave it to the last minute. 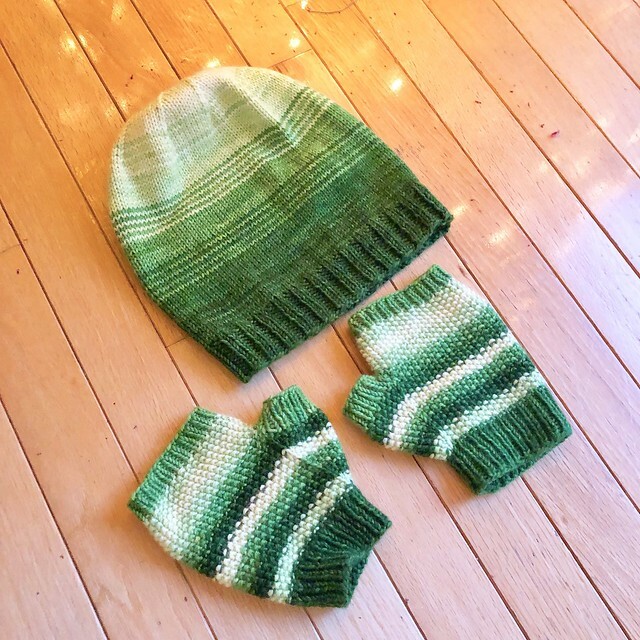 This hat and fingerless gloves set was a Christmas present for my green loving niece. 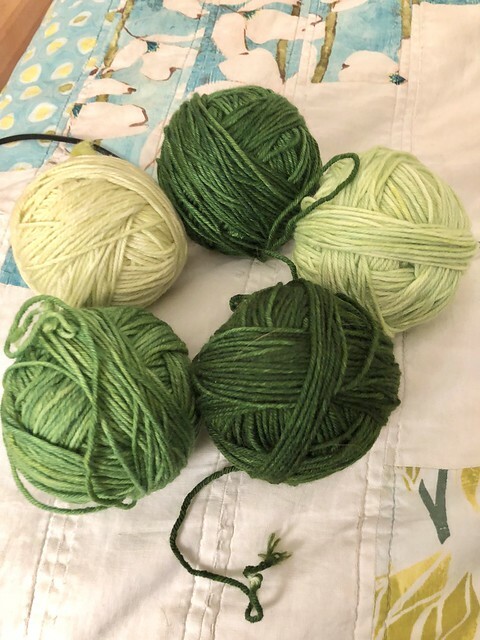 I found this gradient dyed set of yarns by Fleece Artist at my local yarn shop, River City Knits. 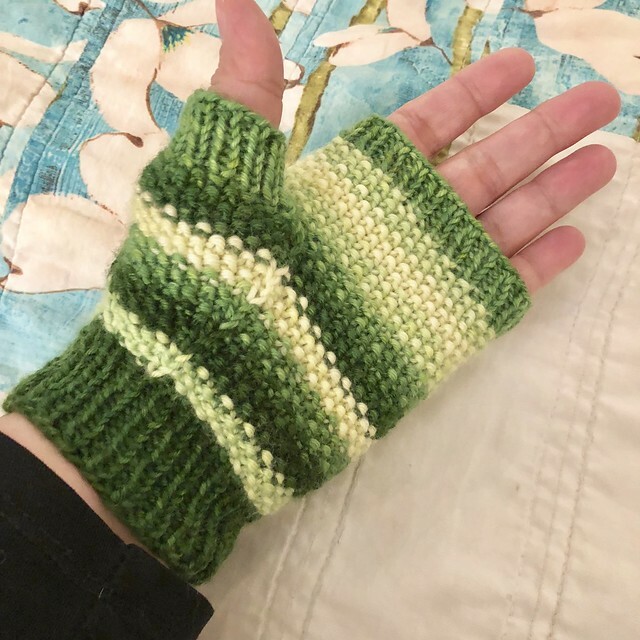 My niece loves green so I knew if I bought them she would get a knitted gift this year. 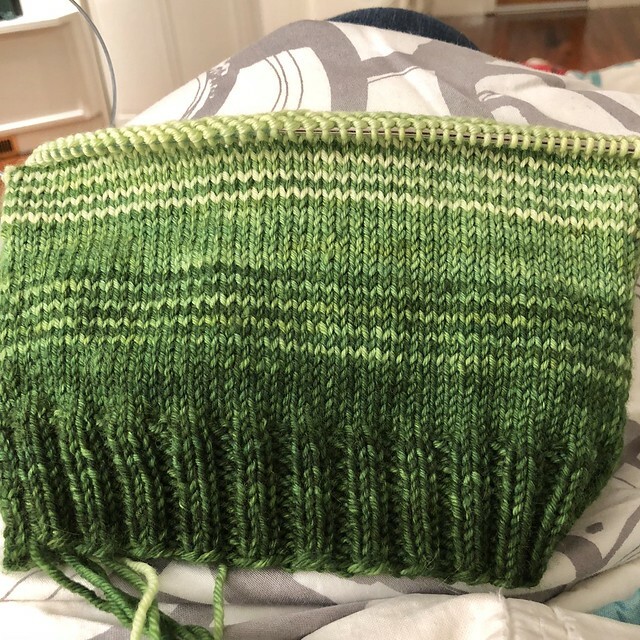 After a couple of false starts, I developed a basic hat pattern with a gradient pattern. There was lots of yarn left so I decided to add the fingerless gloves. She is a teenager, so while I debated mittens or fingerless gloves for a while, I decided that easy access to device use would mean that gloves would be worn more. 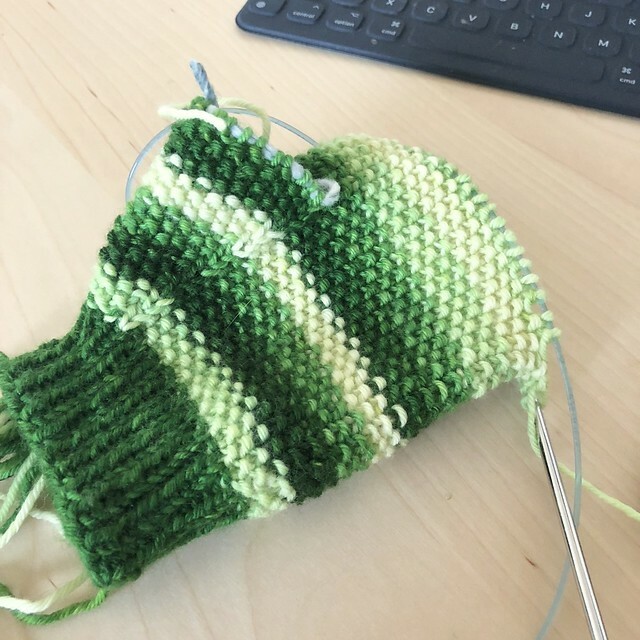 Again I developed my own pattern and a set of stripes. The fanciest part is the thumb gusset, which makes the gloves a lot more comfortable to wear. It is a feature that looks so much harder than it is so I usually include one. Yesterday, I made a Make-up Roll. 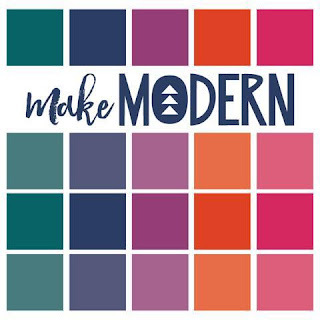 I used this lovely pattern by Rachel Hauser from Stitched in Color. You should know that I made it for a person who loves hedgehogs so I used a linen hedgehog print I had on hand. 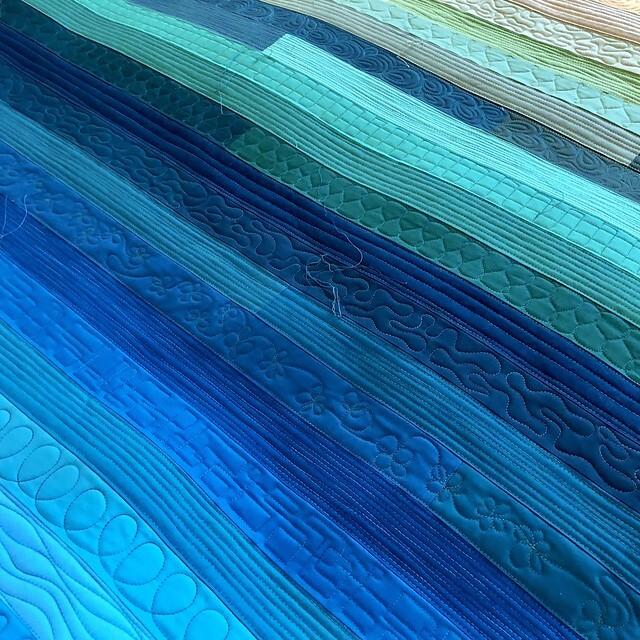 The pattern has a number of pocket variations. This roll is primarily designed to hold nice brushes and it works really nicely. It is a bit fussy to make but I was able to start and finish in about 2 hours. 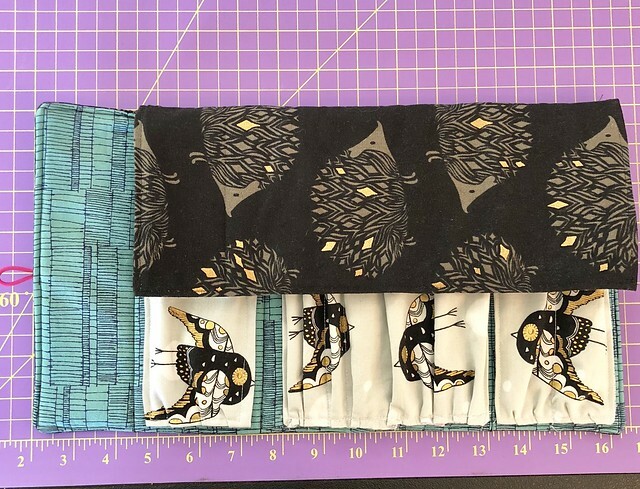 The fold over flap is the best part, it keeps the brushes and other things from falling out the side of the roll and shows off your lovely fabric nicely too. The linen did make sewing it a bit harder, next time I will bring out my walking foot. 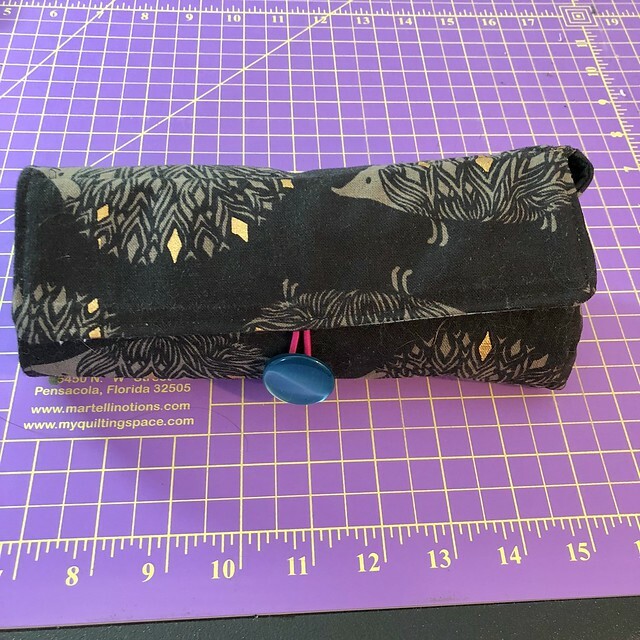 It was really nice to make a small project and be finished it all in one sitting, a good way to ease back into regular sewing. I hope you enjoyed your new year's celebrations, and I wish everyone the best for this coming year. Light is a quilt still in progress, here she is on my king size bed. 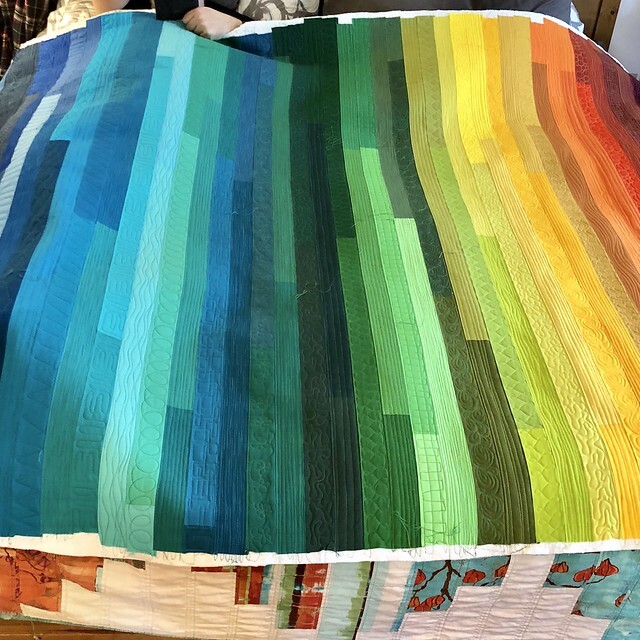 She still needs a binding and to have all those thread ends from the quilting mended in. 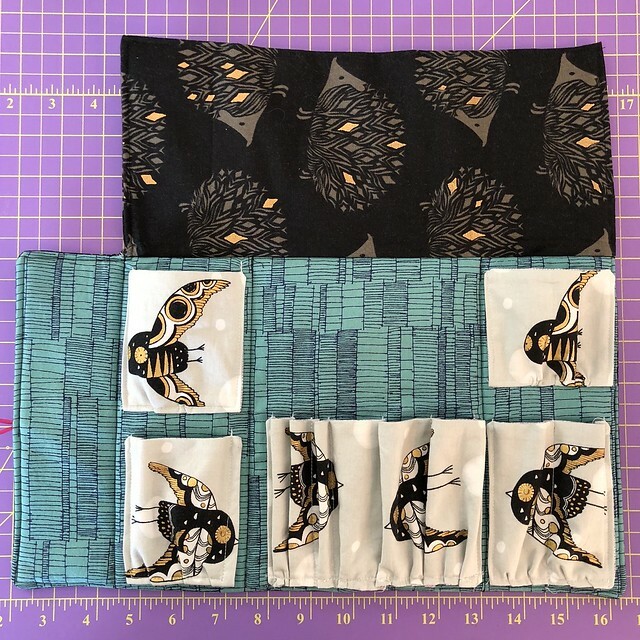 I used an idea I saw my friend Yvonne from Quilting Jetgirl use of placing different quilting patterns in different strips on a quilt. My "rule" was that every other row would be lines of some sort and the rest would be to try, practice other motifs. 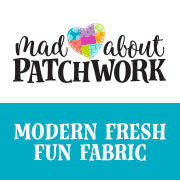 Some of those motifs I will do again, some I was happy to finish the row. 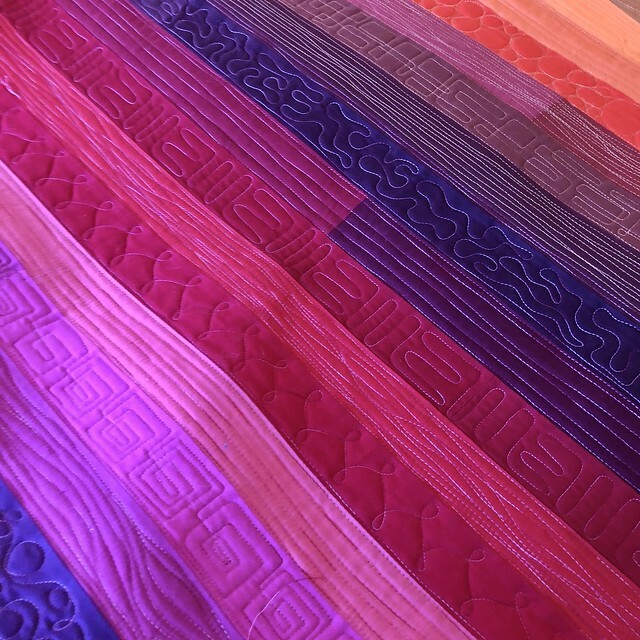 I am interested to see how washing and drying will change the texture and look of the quilting motifs and the quilt itself. 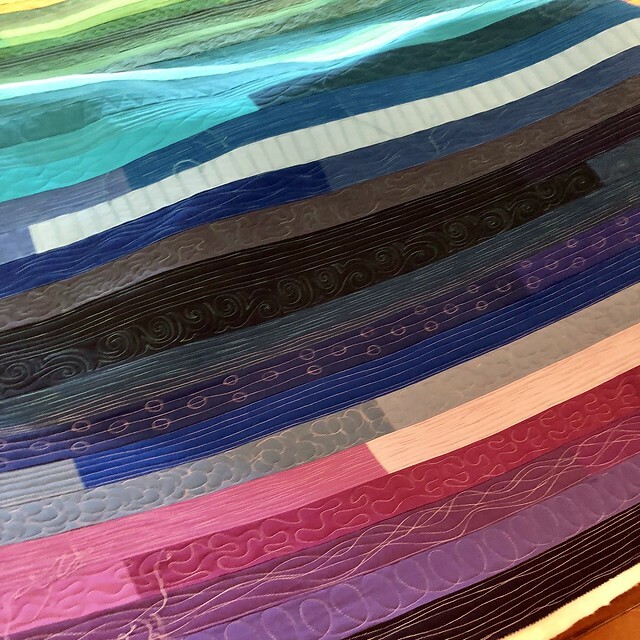 To make this quilt I took 3 jelly rolls of Kona solids that I had acquired over the years and divided them up by colours and sewed them together and then cut the strips into about 70" lengths. Now I think that 80" would have been a better width for the bed but this will still work nicely. 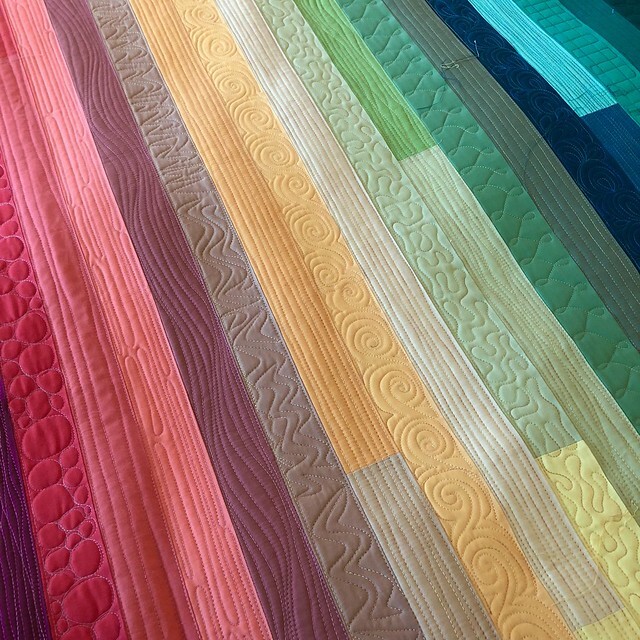 I used a rainbow of quilting threads, all Superior Threads King Tut 100% cotton. I used about one bobbin per two rows of colour. 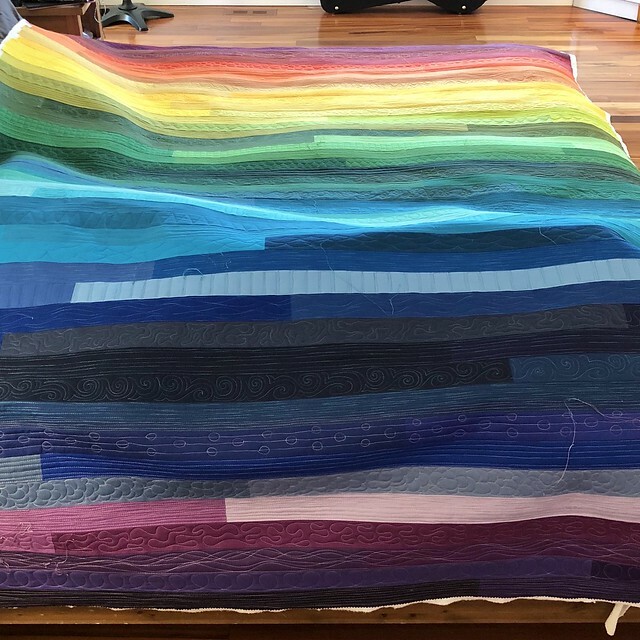 So a lot of thread is in this quilt. 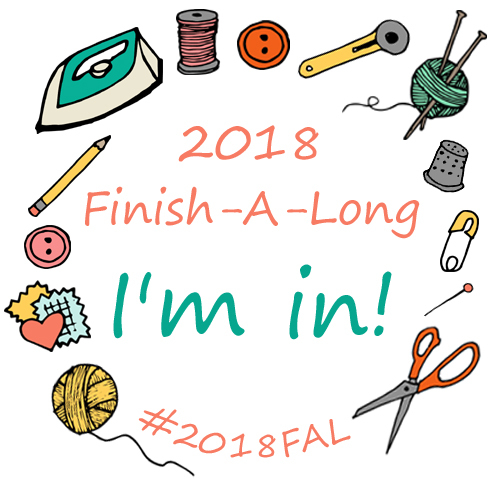 I am planning to quilt a lot more this year. So I have ended/started the last and new year as I hope to carry on. 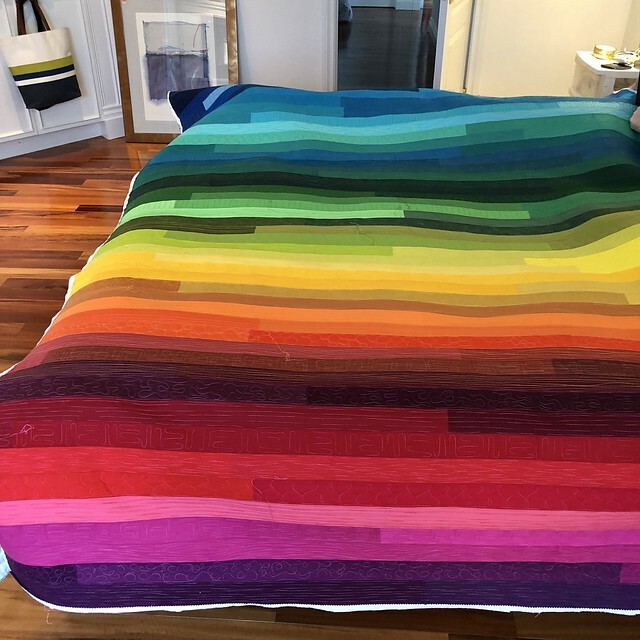 I did photograph this quilt while my dear spouse was napping. He is a very patient guy. Also he is happy to have a new quilt for the bed. I am also planning to be in this space more this year. All the best to you and yours for the New Year!